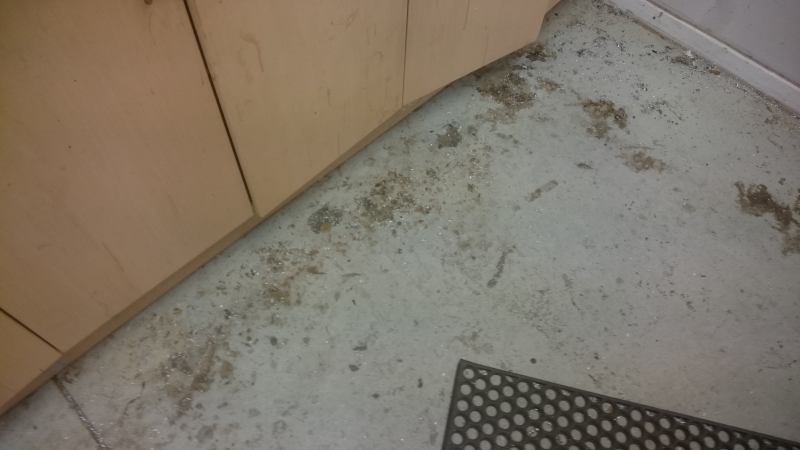 It was worn through in many places, had epoxy and crap stuck all over it and generally detracted from the ambiance of the facility. But it IS 10 years old, so I decided it was time it had a birthday. Step 1 was grinding it back. 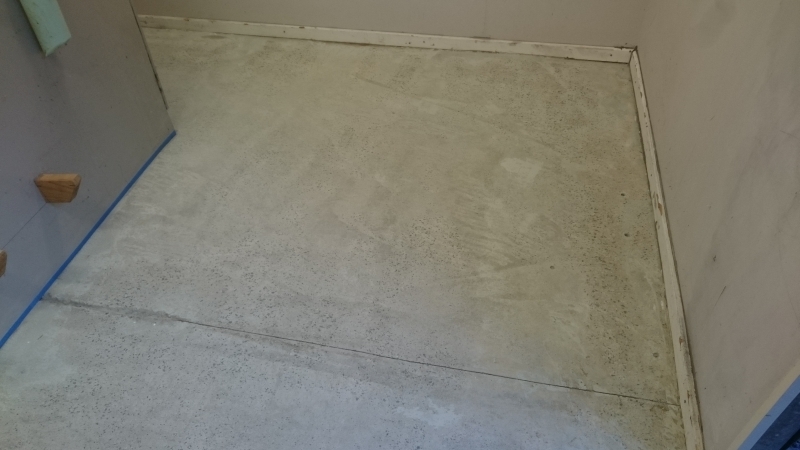 I hired a reasonably big machine and, with the help of a little foresight that allowed me to flood the floor without damaging anything (painted kickboards on all the benches, sealed to the floor), we had it cut back in about 20 minutes. It seemed to be a polyurethane variant and claimed to be stronger than epoxy. It also claimed to be ultra high gloss, but I got the optional clear coat kit anyway. Other claims were 45 minute pot life at 24degC and 23m^2 coverage. So I ran the aircon for two days to dry the slab and keep everything at 24degC, Mixed the plastic which comes in a two part pouch making this step easy. I set a timer for 30 minutes and had at it! 1. There was no way this kit was going to cover the 17m^2 of floor I had. 2. The pot life was going to be a fair bit less than 45 minutes! Not happy! 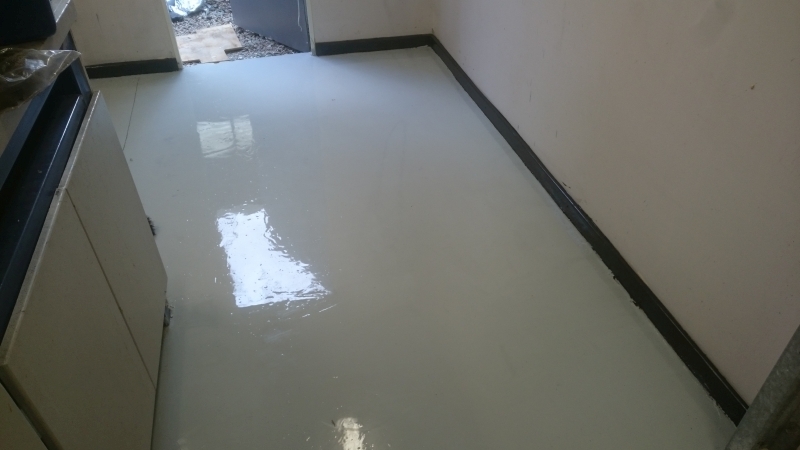 The coverage on the rest of the floor was patchy and there was very little gloss. The one plus? That roller that I just leaned against the wall when I walked away in disgust had to be removed from the floor with a cold chisel the next day. So I knew that the stuff was going to stick! 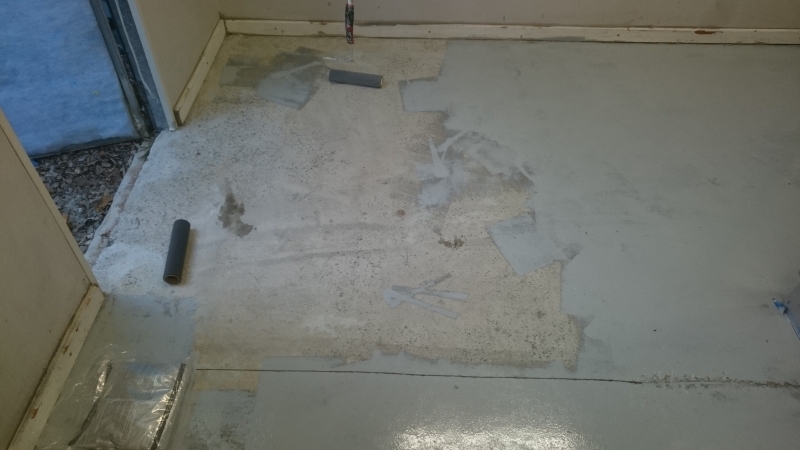 The next day I returned the clear top coat (which wasn't going to cover the floor area anyway) and bought a double garage kit of the same grey which claimed to cover 45m^2. I put it in the fridge for the afternoon and let the workshop cool to about 20 deg C.
This time it was less "rolling on paint" and more "spreading it out". I retired for the evening happy with the outcome.. The next morning though, all I could see were the skirting boards I didn't paint 10 years ago.... Sigh. After that, I did my best not to look at the walls and just started moving equipment back in.. In the end, the result was what I wanted, I just ended up using 4 times as much product as the manufacturer recommended. PK, I feel your pain. But, you got it done and it looks great! Bit like one modern super-duper tiling grount I bought pallet full of bags and tried first mix. Exactly as in instructions.....Did not work, scraped all out and next day I biched to sales guy big time. He got back to me shortly with an email and explaind "on these circumstances you are better of....." and list went like using coldes watter you can get, certain mixing speed, rest times etc.....And it worked. But why all sales talk and info on the product itself is merely to boost sales, not actual working instructions. Beats me. PK I did exactly the same thing in my workshop. Every time I put down paint it would chip and come up. Not the paint chipping, but the 'fat' of the concrete where it had been hand-finished. I used a 9" grinder with a diamond cup wheel and vacuum extraction adapter to grind a few mm off the floor until it started to expose the aggregate. 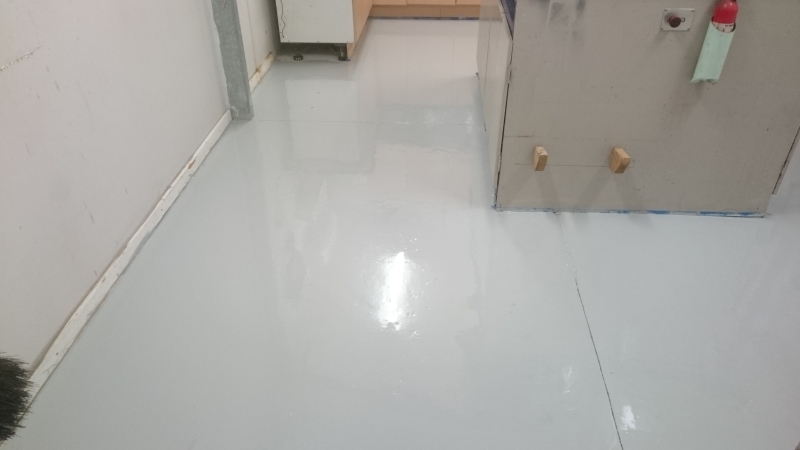 After that I put on 2 coats of air-drying floor paint and left it to dry. The result is a smoother, hader floor that allows easier clean-ups and best of all the finish is still good a year later. PK I did exactly the same thing in my workshop. Every time I put down paint it would chip and come up. Not the paint chipping, but the 'fat' of the concrete where it had been hand-finished. I didn't mentioned that I ground the floor before I applied those 6 coats of paving paint. If you could all believe that I did this because of my deep understanding of floor painting techniques, and not because I'd leveled the floor so badly when it was poured that there wasn't a flat meter in the whole thing and I had to grind it to have any hope of getting the benches level, then I'd really appreciate it! The old carpet is great at saving, or at least cushioning, dropped tools and saving sharp edges being damaged.